Belle’s unwelcome suitor, Gaston, attempts to persuade her to marry him. He also informs her that, “It’s not right for a woman to read. 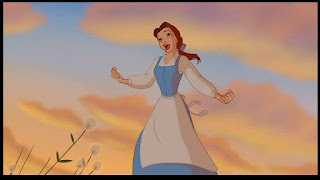 She starts to get ideas.” Even Belle’s well-meaning father wonders if she might find happiness settling down with Gaston. Belle was determined to break out of the limitations others placed on her. Jesus also brushed shoulders with those trying to limit Him. The religious leaders of His day looked with disdain as He healed on the Sabbath and ate with tax collectors and sinners. The Jewish people attempted to make Him their king at one point and wanted to stone Him the next. Even his family thought He was crazy for a time. Jesus knew His Father’s plan for His life and stayed focused on the goal in spite of other’s opinions. In Hebrews 12:1 we are encouraged to push past limitations. Trying to live the life others believe we should live is like trying to run a race with heavy weights and ropes confining us. By reading books, Belle found that a big, wide, wonderful world existed beyond her community. As I read The Great Book, I am convinced God has uniquely designed experiences in store for each one of us. Lord, help me to live according to Your purposes alone.